In this book, I have summed up how to put your space in order in a way that will change your life forever. I’ve fallen for organization books before, but this one felt different and it was taking the Internet by the storm at the time so I thought I’d give it a try. I focused on the two areas the caused me the most pain: my bedroom and my kitchen. I also tenderly moved into my books while remembering that surrounding myself with books, in itself, brings me joy. I’m going to share what I’ve learned in this past year and what’s worked for me and what hasn’t, but first, let’s just review how much I needed some type of help with organization by looking at the before picture I posted on the Internet for the world to see. And this is my closet today with only minimal, “I’m going to take pictures so I’ll turn the hangers facing the same way” improvements. This is what I see pretty much every day now. Marie Kondo promises that anyone who goes completely through her process has never backslid; that following her method causes a permanent change. In her new book, Spark Joy: An Illustrated Master Class on the Art of Organizing and Tidying Up, she defines not backsliding as having a place for everything and being able to put everything away in 30 minutes if company is coming over. 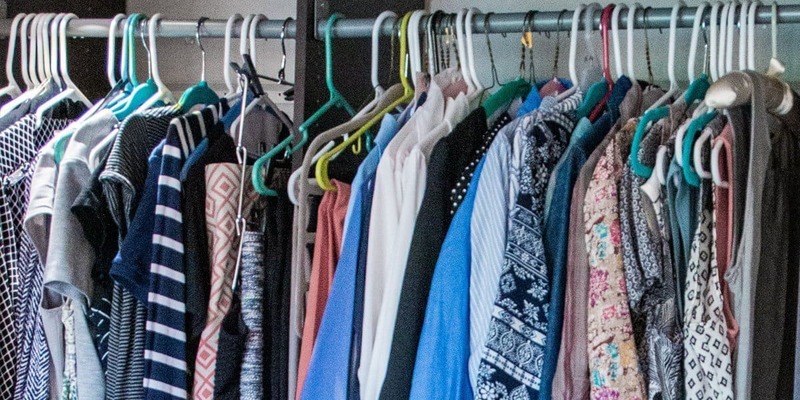 I’ve more than surpassed that standard and in this past year, I’ve learned to experience a new type of joy: that of reaching for a shirt in my closet or tool in my kitchen and finding it just where I thought it would be on a regular basis. It’s a pleasant, satisfying experience. Here’s a quick overview of what has worked for me and what hasn’t. 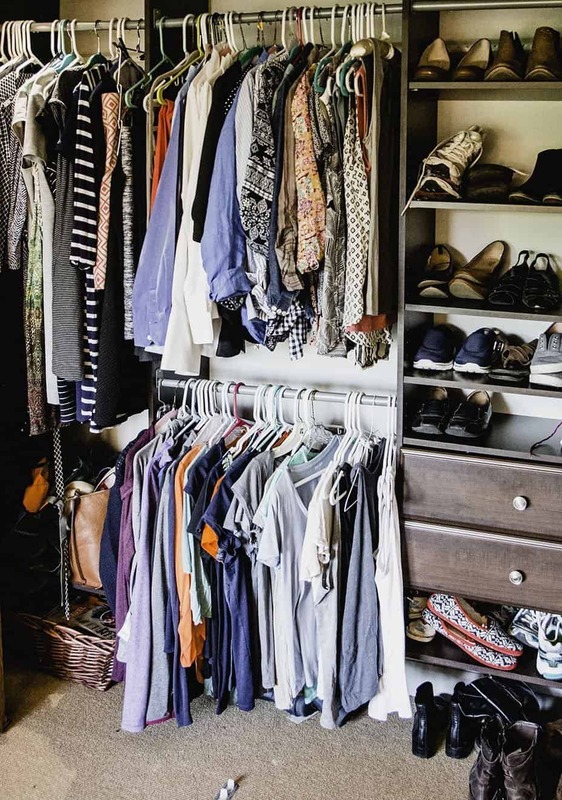 Marie Kondo emphasizes that when you’re going through the discarding process, you’re not looking at what to discard, you’re looking at what to keep. What actually gives you pleasure? If you can’t say absolutely yes to this, then don’t keep it. The goal is to find yourself surrounded only by the things you love. I took to this goal so enthusiastically that we discarded several pieces of furniture, including our dining table. My major kitchen reorganization took much longer than I thought it would for a couple of reasons: touching every item in the kitchen to see if it sparked joy was time-consuming, and determining where things should return to once I took everything out took at least twice as long as I thought it would. However, once I found a good place for each item, I finally discovered the pleasure of having a well-defined place for every item and six months after my big kitchen reorganization, things are still in place. Such a delight. 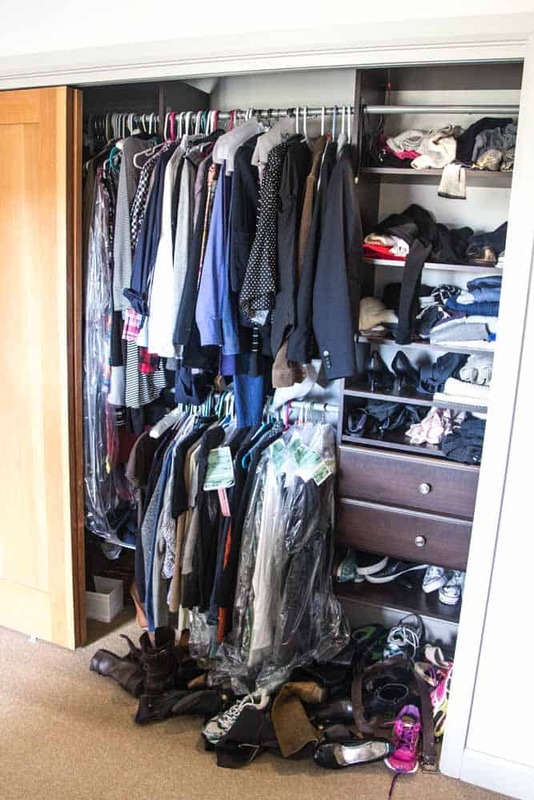 My jeans and sweaters and even my socks and tights looked neater and were easier to find in my drawer folded vertically using the KonMari method. By the way, the best resource I’ve seen for how to fold things using the KonMari Method is this one from Goop. And here’s a tip from me: fold things tightly. You want your little clothing packet to be able to stand up on its own. How about you? Have you tried any of the KonMari methods? What’s worked for you? What haven’t you liked? I’m in the process of doing a massive empty nester decluttering — and documenting it on my blog to help make me accountable. It’s fun to read about someone who’s done it and what it’s like a year later. There’s hope! (Don’t think I could fold my shirts that way, either! ) But getting rid of things that don’t bring you joy is cathartic. Thanks for posting-just checked out your blog and love it! Can’t wait to see your progress. One thing I do is make a plain tag out of a 3X5 card. I cut it into 3 pieces and put a hole in the top. Whenever I wear something or wash it, I put it on a hanger with a tag. At the end of the season, the clothes with no tags get donated except the holiday or special outfits that I wear to parties or on cruises and just didn’t have an opportunity to wear it. That’s a great idea and a wonderful way to really see what you wear. I used the “work by category, not by room” concept earlier this week with satisfying results. The category was “cleaning supplies” which I unearthed in some very odd locations. Pasta, tomato sauce and Windex: which item does not belong? I got every last can, bottle, box, rag and tool in one place –a real mess. Then I returned everything that belongs to the bathrooms and the kitchen (one each) to their proper place. All the multi-purpose items went (one each) in a crate with handles. The overflow, including enough Lemon Pledge to dust Buckingham Palace, went into one cupboard so I can work down inventory. I can’t say that Kaboom Bathroom Cleaner by itself gives me joy but having just enough readily at hand to take care of chores most definitely does. That’s so great Mandy. We did something similar a while back with our cleaning supplies and found the same situation with pledge. What’s up with that? One can upstairs, one can downstairs, one can in the kitchen… We finally ended up donating a huge portion of them and keeping just the minimum where they are needed. And you’re right – it’s a strange form of joy!